This incredible product has streamlined the sheetcake baking process by eliminating the hassles of pan extenders,reducing mess and waste,and increasing your efficiency. They bake on all sides! eliminating the raw edge left from the extenders,which makes decorating the cakes much easier,less messy,and less costly. Because of their unique construction,these pans are guaranteed NOT TO WARP FOR LIFE! Also,they nest together when not in use, which saves you space. These pans are being used successfully in hundreds of bakeries, some for nearly 20 YEARS!!!!!! Attesting to their durability and overall cost savings. NO MORE BUYING NEW BUN PANS AND EXTENDERS. THESE PANS ARE A ONE TIME PURCHASE, WE HAVE YET TO REPLACE A PAN IN NEARLY 20 YEARS. 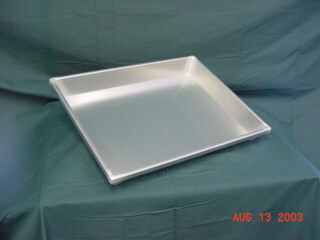 These 18"x26"(16"x24"product size) and 18"x14"(16"x12"product size)x2"deep sheet cake pans,are designed for constant reuse by allowing for immediate product dumping,thereby reducing the total number of pans needed. The prices of the pans begin at $40.50 ea. for full size $38.50 for half size and reduce as quantities increase.